Nala Walla is an integrator. She weaves a holistic and commonsense approach to wellness as a Certfied Nutritional Therapist, Grief Recovery Specialist, and Permaculture Designer. Her compassionate and empowering style of coaching helps to repattern deep connections to soul and to place, via human and more-than-human communities. Foundational work in traditional and ancestral nutrition combines with somatic release techniques to encourage healing and unwinding. Deep attention is given to developing personalized ritual practices which support the grief process and foster ongoing relationship to ancestors . Nala completed her undergraduate studies at Dartmouth College, and her masters work at the University of Washington and Gaia University. A firm believer in ongoing education, she has continued her studies with the Moving On Center, the Center For Kinesthetic Education, the Nutritional Therapy Association, and the Grief Recovery Institute. 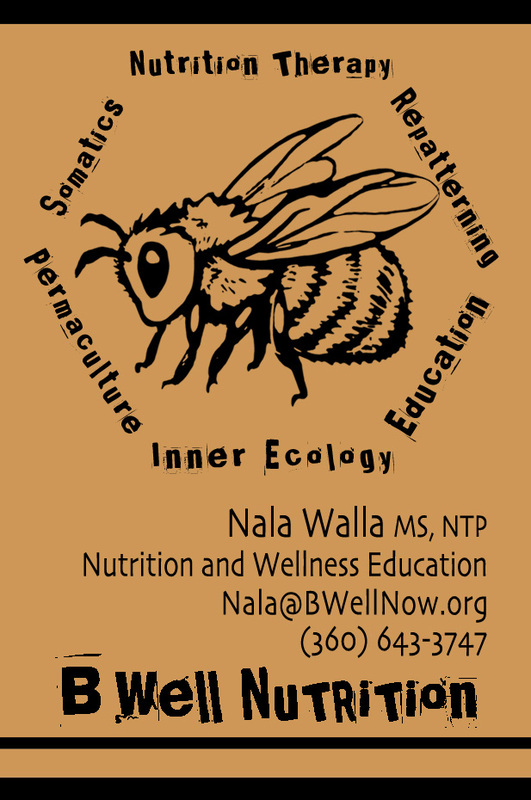 Nala has also been a Certified Permaculture Designer for over ten years, and is the current leader of the Jefferson County Chapter of the Weston A. Price Foundation. Please call to schedule a free half-hour consulation. • "On-The-Go" Strategies for busy moms, business travellers, etc. The approach in a repatterning session is, in essence, to offer support for optimal nutritional and somatic function. Implicit is a profound respect for the human body's ability to regain balance once its basic needs are met. In contrast to the conventional focus on chasing individual symptoms, this foundational approach taps into the innate intelligence of the body, and ensures that changes we make are systemic, holistic and lasting. In a repatterning session, we are provided with 'take-home tools' and skilled guidance to activate our inborn healing capacities. This focus on self-reliance aims beyond a dependence upon practitioners or drugs to simply "fix" the client. In repatterning work, it is the client who takes the lead in their wellness journey. Repatterning is thus both a privilege and a responsibilty: we are supported to create healthier patterns at our own pace, and simultaneously recognize that no one else can do this work for us. The limits lie only in our willingness to participate. Repatterning work combines nutritional and epigenetic sciences with somatic practices (along with a helping of good old common-sense) to approach wellness in a way that honors the entire mind-body system. By gently increasing awareness of our habits and their connections to pain, tension and fatigue, we begin the process of "reprogramming"' healthier patterns. A key aspect of this work is reconnection with our own bodily wisdom, and the understanding of ourselves as natural systems, with various levels of ecologies: from the individual body and our own "microbiome", to the social bodies of our families and communities, onward to the greater ecologies of our landscape and the earthly body. We highlight the systemic relationship between the inner and outer, the neurological and ecological, thus creating more effortless integration between self, community and place. Repatterning makes a wonderful complement to other health and community care modalities such as herbal medicine, physical therapy, chiropractic, acupuncture, massage, counseling, etc. WHO BENEFITS FROM INTEGRATIVE WELLNESS SUPPORT? • Seeking support for chronic health issues related to digestive dysfunction, food sensitivities, and nutritional deficiencies. • Hitting plateaus in conventional medical treatment, talk-therapies, or bodywork. • Interested in deepening connection with and supporting your local foodshed. • Stymied by highly-structured training in the arts, in business, in academia, and wishing to restore flow and play to your career and life practices. • Looking for an "outside the box" approach to help break through discomfort, creative blockages, and tension. • Seeking to integrate sustainable methods of self-care into your daily regime. • Seeking improved 'range-of-motion' in personal, team and community life.